For your viewing pleasure, I have created a new "Debris Archive" page, which has photos and basic info on all of the items I've written about so far. Additionally, each imaged is linked back to the original blog entry should you care to read more about a particular item! Click on "Debris Archive **NEW**" at the top of the blog. 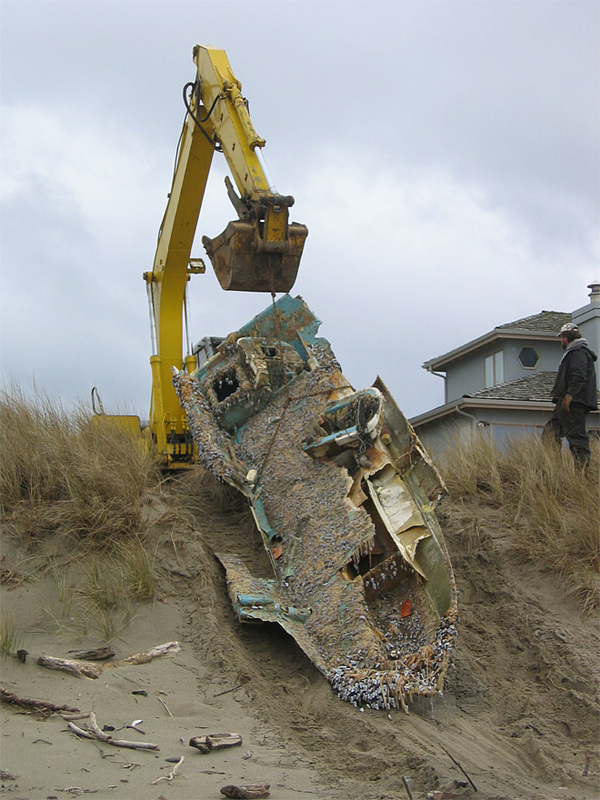 On February 5th, a 27-foot fishing boat washed ashore in Gleneden Beach (Lincoln City), Oregon. Once again, biologists and researchers from Newport's Hatfield Marine Science Center and Oregon Department of Fish and Wildlife were on the scene to catalog and identify organisms hitchhiking on the item. After this was done, crews were able to remove the boat by using no less than a backhoe to drag the skiff off the beach. Writing on the boat confirmed that it was in fact Japanese, although it hasn't yet been traced back to its port of origin. It was covered in organisms similar to that of the previous docks and boats washed ashore.